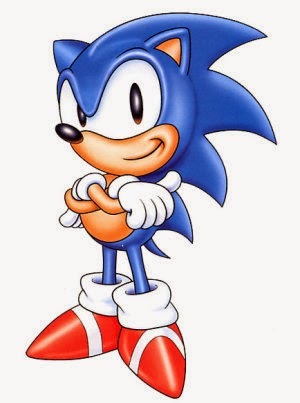 Sonic the Hedgehog is the world's fastest hedgehog. People see just a blue blur as he races over the land to defeat the evil Dr Robotnik and his robot creations. He claims to be able to travel faster than light... a strange claim given that hedgehogs can only run at 15mph. Is Sonic a special hedgehog then? Or is he simply no faster than a normal hedgehog? There is little reason to believe Sonic is special. The biggest difference between him and normal hedgehogs is his vivid blue colouration. Of course, colour doesn't affect speed in any way, and science tells us that a speeding object shifts towards the red end of the spectrum in a 'red shift'. Blue would indicate that Sonic is somehow slower than a normal hedgehog! Sonic wears a pair of trainers, though these shoes are not magic shoes as far as has been proved. Additionally, hedgehogs are used to running on four legs not two, so Sonic's bipedal gait would hinder his movement rather than speed him up. We see Sonic move really fast on screen though... but what are we really seeing? Remember, we can only judge his speed relative to everything else that we see, and nothing has a correlation in the real world. His best friend is Tails, a mutant fox with two tails. Tails' tails are gigantic, almost as big as his body. This, combined with his genetic mutation must make him slow indeed, barely able to take step after agonising step. Sonic battles robots that have little animals trapped inside them. They are slow and lumbering, and we know from how happy the animals are to be released that they are not willing participants. It is very likely that these metal prisons barely move at all. Sonic's chief antagonist is Dr Robotnik (cruelly referred to as 'Dr Eggman') an obese old man who can barely get out of his chair. From the above evidence, it is thus seen to be much more likely that Sonic is no faster - or indeed slower - than a normal hedgehog. However he lives in a world where everyone around him is incredibly slow, leading to the illusion that he is the speediest hedgehog alive.